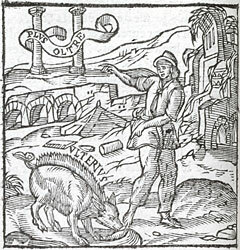 Alciato at Glasgow: Emblem: In dies meliora. Tousjours de bien en mieux. Haecque cliens ventri xenia, dixit, habe. Gramina cùm pando proruit ore vorax. Cedat: & ut melius sit, quod & ulterius. A dependant of mine brought me the head of a bristly boar at the New Year and said: Here is a present for your insides. - The pig always moves forwards and never looks back as it greedily tears up plants with its flat snout. - Men have the same attitude - they don’t want hopes to collapse and fall back, they do want what lies ahead also to be better. quod ulterius fuerit, sit semper melius. Tousjours de bien en mieux. 1. setigeri suis, ‘of a bristly boar’. For pork as a seasonal present at the Saturnalia (17-23 December), see Martial, Epigrams, 14.71: ‘This pig, fattened on acorns among the foaming boars, will make your Saturnalia happy’. 2. ulterius. This, the last word of the epigram, is written on the back of the boar in the pictura, where it suggests the meaning ‘ever onward’.